Radio 3AW’s Neil Mitchell said this morning the “numb nuts” who want to tax soft drinks in order to tackle obesity, and tax this, that and the other, for such-and such reasons ought to “get out of our lives”. Health and other experts are constantly telling us what we should be doing to the tax system in order to fix this or that, he says. It’s hard to disagree with Mitchell that we have indeed become a nanny state. He mentioned the case of a chap in the municipality of Darebin who has been charged double rates on the lot on which he grows vegetables next to his home, because council considers it to be ‘vacant’, and doesn’t want to encourage vacant allotments in residential areas, veggie gardens or not. Mitchell’s examples parallel goings-on in the tax forum being held in Canberra over the last two days. 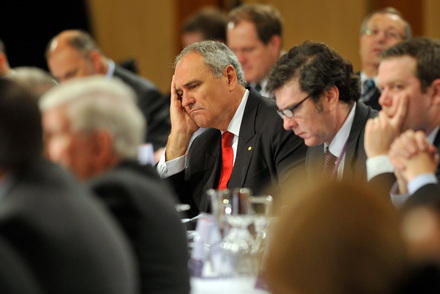 The experts have been invited, so we’re getting a cacophony of views commenting upon the far-reaching recommendations of Ken Henry’s panel which inquired into ‘Australia’s Future Tax System’. Many participants, of course, argue from a perspective of self-interest, instead of what’s good for the nation. I’ve watched some of the Canberra proceedings streamed live, and, looking at Ken Henry, imagine he must be terribly frustrated at what’s happening about him, because his panel recommended the abolition of a multiplicity of inefficient taxes, and the use of four revenue bases, only. This has virtually become invisible in the discussion. I could see the invited experts are obviously very intelligent people, but, each and every one of them has been deprived the privilege of studying Ricardo’s Law of Rent (community-created economic rent) in any depth. With all this obfuscation, it is therefore remarkable that Ken Henry chose land tax as one of the four most efficient tax bases around which Australia should seek to build its future. If the character of a nation is shaped by its system of taxation, against this criterion we should be capturing to the public purse the nation’s economic rent: the whole rent, and nothing but the rent. The understanding that individuals ought not be able to privatise the 50% of the economy which is our economic rent – created not by individuals but by the Australian community as a whole – sadly continues to elude our ‘experts’. Previous PostAND SO IT BEGINS ….Next PostCALLOW CAMERON?